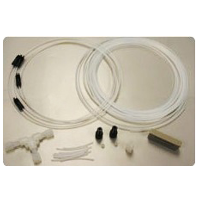 The Syringe Pump Starter Kit includes a selection of fittings including ferrules, PTFE tubing and head fittings to enable fluidic connections to be made between Dolomite's Syringe Pumps (Part Nos. 3200056, 3200057 and 3200066) and a microfluidic system. 10m FEP tubing 1.6mm O.D. 0.25mm I.D. 10m PTFE tube 1.6mm O.D. 0.8mm I.D. This starter kit contains all the required tubing, fittings and accessories for generating droplets with the Syringe-based Droplet Starter System. For further information on this product, please download"